Hi there, new poster wondering about something of really very little importance but of curiosity value to yours truly. 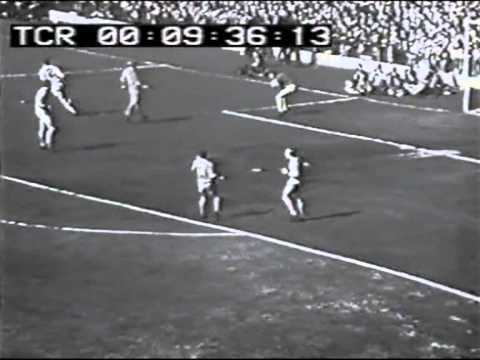 I was watching the ole youtube the other day and noticed that up until 1970/71 televised matches at Anfield had the Kop on the left of the screen. But a couple of years later (not sure exactly when the change occured) the Kop was to the right. I thought initially that this had something to do with the building work at Anfield which (I think) was completed between 1972 and 1973. But I may well be wrong. So when did the camera positions change at Liverpool`s ground? This is an excellent opening post and worthy of WSC and OTF nerdiness. Seconded. If this was on the Letters page of the magazine we'd be getting replies with related anecdotes for a good year out of this one. Thanks. I was thinking too that I can't think of any other stadium of any importance in England where the TV view suddenly switched to the other side of the pitch. Old Trafford has always had the Stretford End to the left, Everton's Gladwys Street has to my knowledge always been to the right, and so on. This is excellent. In recent years the camera appears to have changed sides at Middlesbrough and I have vague memories of the cameras moving at Bramall Lane in the 90s too. At East End Park the club got media studies students from the high school to record games whilst the real telly cameras were on the opposite side. Old highlights videos and season review videos ended up having games shown from both angles depending on what the editors could get their hands on. Would it be related to work on the stadium and upgrading of media facilities? I concur with the view that this is a great subject. Middlesbrough changed in 2016 following promotion. More interestingly, before the World Cup in 1966, the camera position at Ayresome Park was actually in one of the corners. I can't find anything on line to back this up, but there's a DVD where this is clearly shown. Red v amber in black-and-white was a pain in the arse to watch by the looks of it. Just heard Wolstenholme refer to the 'keeper's hat as a jockey cap rather than a baseball cap too. Last edited by Kevin S; 15-08-2018, 12:37. Welcome, Sporting. Let us know about your favourite biscuit. I can't answer the initial question, but I'm sure that Chelsea switched their camera side as recently as two seasons ago. Dugouts are now at the bottom of the screen, rather than the top. Bramall Lane had a different camera position for a period in the mid 90s to hide the fact that there was a hole where the John Street stand used to be and United couldn't decide what was going to replace it. Villa Park swapped over for a while circa 2000 while the Trinity Road (?) stand was being rebuilt and the Holte End suddenly went to the right. Otherway round before they rebuilt the main stand, at Goodison, wasn't it? Upton Park (or the Boleyn Ground if you prefer) changed in about 2001 when the West Stand was opened, then I think it changed back a few years later, though I can't be sure when it was. Not an English ground (quite the opposite in fact), but I noticed at Hampden last year Sky and ITV had their main camera position on opposing sides of the ground. Isn't that for advertising purposes? In my mind's eye, my old seat at St. James' Park was behind the left-hand goal, as viewed on television. This is completely backwards, and I know it to be so, but I still can't change the way my brain works. GO touches on a point that I was going to raise, which is that a number of grounds (particularly on the Continent) have cameras on both sides of the pitch, with the electronic advertising hoardings being programmed to display adverts targeted at specific audiences. That said, I think that a growing number of clubs and competitions with international audiences are viewing this additional revenue stream as being worth the infrastructure investment. Watford switched for a few seasons at the beginning of the decade. There's a TV gantry in the roof of the Graham Taylor stand (formerly the Stanley Rous stand), but based on a quick glance through YouTube we switched to one from the Sir Elton John stand side (then called the East/Main stand) around the 11/12 season. This was because the East/Main was shut at that time, bar the dressing rooms and press box (although even that moved eventually), and in a major state of disrepair. Presumably the club didn't want that in shot all the time. The new gantry was made from scaffolding at the front of the stand - definitely lower than the gantry on the other side. They switched back, again based on YouTube, for the 13/14 season by which point we'd been taken over by the Pozzos and the decrepit stand had been demolished and a rebuild had started. To be honest, I had it in my mind that we'd switched for a longer period of time. I seem to recall watching a League Cup game between Watford and Spurs in 08/09 on TV in Australia and it being from the East Stand side, but that may have just been the broadcaster hating the view (although the East Stand wouldn't have been fully shut at that point, I don't think). That does ring a bell thinking about it, although sadly I can't find highlights to confirm. Last edited by JM Footzee; 15-08-2018, 12:56. Welcome aboard sporting, looks like you'll fit right in. The 'main' stand at Anfield was probably completed in the early 70s wasn't it, complete with virtiginous camera gantry suspended from the roof. I toured the Aviva Stadium in Dublin last year and they confirmed they have camera positions in each stand to facilitate multiple broadcasters and dual pitchside advertising strategies. Do we know, ursus, is the implication there that the Champions League regulations require x amount of reverse angles for the satisfaction of broadcasters because it gives more replays that VAR/their pundits can 'analyse', or simply because they allow for the game essentially to be shown from two entirely different perspectives and thus allow different advertising to be shown to different markets? And welcome, Sporting. It's some feat to open your account with such a pleasingly niche – yet discussion-provoking – query that no-one seems to have hit upon before per se. As big cheese Snake says, do tell us your favourite biscuit. Last edited by Various Artist; 16-08-2018, 08:58. [QUOTE=seand;1465238]Welcome aboard sporting, looks like you'll fit right in. The 'main' stand at Anfield was probably completed in the early 70s wasn't it, complete with virtiginous camera gantry suspended from the roof. The biggest redevelopment came in 1973, when the old Main Stand was partially demolished and extended backwards with new roof. Simultaneously the concrete pylon floodlights were demolished with new lights installed along the rooflines of the Kemlyn Road and Main Stands. So the change in camera positions happened before the completion of this stadium redevelopment. How long did this work take? I've been looking but found no firm answers so far. VA, I think that the "reverse angle" rules reflect both motivations, as do the "Media Matter" and "Exploitation of Commercial Rights" regulations in general. Those regulations are remarkably detailed (and longer than those regarding the conduct of the competition itself) and worth a perusal, if only to understand just how much of the televised "match day experience" is mandated by UEFA acting at the behest of its "rights holders" and other commercial "partners".